The Shooting Gallery is proud to present Meticulous Engagements: New Works by Kris Kuksi and Christy Langer. Both sculptors present faraway, undiscovered worlds to explore concepts of memory and the stories we have about ourselves. 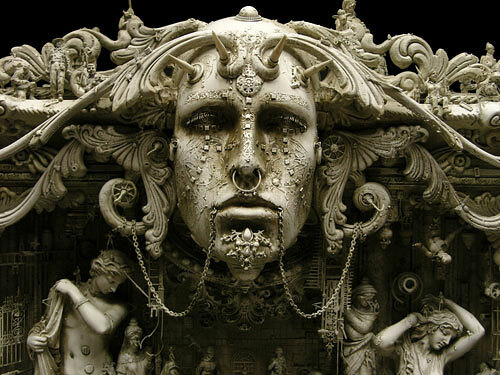 Kris Kuksi assembles wall hanging and tabletop sculptures that range from one to eleven feet in width. His surreal landscapes are home to a tiny community of characters that morph between mechanical, human, and animal forms. These mutations speak of the hidden flaws within every individual and especially of our inability to overcome them. Although society promotes the idea of normal complacency in life, Kris uses enchanting scenes to expose our lack of control and the animal within. Kris’ material comes from collected model ships and tanks, nativity sets, trim molding, jewelry, ceiling medallions, and brass etchings. After modifying the objects to his liking, Kris layers them onto a lightweight base. Paint is applied to achieve the weathered look of gothic cathedrals, classical sculpture, art nouveau, and Baroque architecture that inspire Kuksi. Christy Langer uses three-dimensional animal forms to illustrate the disparity between reality and remembered experience. Portrayed in a light color palette, these deformed and manipulated animals are avatars for their natural state. Christy is interested in the way that documents, records and memories become distorted over time; in the same way, her animals outline the conflict between accurate representation and mutable interpretation. Christy’s process begins with an image or memory as a point of reference. She uses clay and aluminum wire armatures to rough out the figure’s shape and size, then tooling out the details with epoxy putty. After a series of silicone molds and hard urethane plastic castings, the form is cast in resin, reinforced with fiberglass, and painted with oils. Langer takes pride in her labor-intensive process that yields an embellished impression of reality, serving to record the subject and artist alike.